Boston is the capital and most populous city of Massachusetts. As of 2005, the city of Boston's population was 596,638. Additionally, Boston lies within a large metropolitan area, the 11th largest in the United States, known as "Greater Boston", which is home to approximately 4.4 million people. Boston is not only the largest city in Massachusetts, but also in the whole of New England, and hence is often considered the unofficial cultural and business capital of the region. Boston is sometimes known as the "Athens of America" because of the many teaching, educational and research institutions located in the area - including over 100 colleges and universities in the Greater Boston Area, and more than 250,000 students in Boston and Cambridge. Important education institutions in Boston include Boston University, Harvard University's business and medical schools, Northeastern University and Suffolk University. Boston University is a private research university and 4th largest employer in the city. Northeastern University is a private national research university known for its links with business and industry. 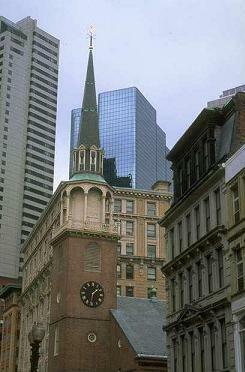 Suffolk University is a small private university, particularly known for its law school. Professional sports teams in Boston include the Major League Baseball team, the Boston Red Sox, the NBA basketball team, the Boston Celtics, and the NHL ice hockey team, the Boston Bruins. Some of the leading companies that have based their headquarters in Boston include Bain & Company, Bain Capital, Gilette (now a subsiduary of Proctor & Gamble), Liberty Mutual Insurance Group, New Balance and The Boston Consulting Group. The main airport for Boston is Logan International. Boston's nicknames include "Athens of America", "B-town", "Bean Town", "BeanCity", "Beantown", "City of Notions", "Puritan City", "The Bean", "The Cradle of Liberty", "The Hub", and "The Hub of the Universe". Written by locals, Fodor’s Boston is the perfect guidebook for those looking for insider tips to make the most out their visit. Complete with detailed maps and concise descriptions, this Boston travel guide will help you plan your trip with ease. There's history and culture around every bend in Boston―skyscrapers nestle next to historic hotels while modern marketplaces line the antique cobblestone streets. The city that blends yesterday and today has much to offer, and with this updated Fodor's Gold Guide first-time visitors, as well as returning visitors, will discover all of Beantown's old and new charms. •UPDATED COVERAGE: Fodor's writers have scoured the city to find the best new hotels, restaurants, bars, shops, and sights. •ULTIMATE EXPERIENCES GUIDE: A visually stunning color photo guide covers the essential sights and unmissable attractions throughout Boston. •FREE PULLOUT MAP AND DETAILED MAPS: A handy PULLOUT map will help you navigate on the go. Full-color and full-size street maps throughout will help you plan efficiently and get around confidently. •ILLUSTRATED FEATURES: Gorgeous full-color features on Boston's Freedom Trail and New England's whales and whaling history. Illustrated cultural spotlights on Isabella Stewart Gardner Museum and the Museum of Fine Arts bring these wonderful institutions to life. •INDISPENSABLE TRIP PLANNING TOOLS: Top Attractions, Great Itineraries, and Family Favorites features make it easy to plan a vacation. Lists of Freedom Trail sights in each neighborhood; easy-to-read color regional maps; and tips for traveling with kids and frugal fun provide useful at-a-glance travel resources. •COVERS: Faneuil Hall, Fenway Park, Isabella Stewart Museum, Sam Adams Brewery, the Freedom Trail, the Back Bay, Boston Public Library, and much more. Planning on visiting other destinations on the East Coast? Check out Fodor’s Washington, D.C. and Fodor’s New York City. Compact and affordable, Fodor's 25 Best Boston is a great travel guide for those who want an easy-to-pack guidebook and map to one of the most historic cities in the United States. •GORGEOUS PHOTOS AND MAPS: Full-color photos and full-size street maps cover the best Boston has to offer, all in one easy-to-use package. A handy, weather-resistant pullout city map will help you quickly orient yourself and plan your day. •PRACTICAL TIPS: Travel like a local with our “Need to Know” section, filled with useful travel tips and essential information such as how best to get around. •COVERS: Beacon Hill, Louisburg Square, Harrison Gray Otis House, Museum of Science, Paul Revere House, USS Constitution, Boston Tea Party Ships, New England Aquarium, Newbury Street, Trinity Church, Copley Square, Harvard Square, JFK Museum, best local shopping, markets, restaurants and much more! Planning to visit other destinations in the area? Check out Fodor’s 25 Best New York City and Fodor's New England. With Moon New England Road Trip's practical tips, detailed itineraries, and insider's view, you're ready to fill up the tank and hit the road. Streetwise Boston Map is a laminated city center map of Boston, Massachusetts. The accordion-fold pocket size travel map has integrated trolley lines & MBTA subway map. Boston Rapid Transit Map (MBTA Subway & Trolley Stations). Navigate your way to the highlights of this historic yet lively city. Take in a Red Sox game at Fenway Park, retrace the past on the Freedom Trail, visit an art museum, or enjoy dinner at one of North End's traditional Italian restaurants. The STREETWISE® Boston city map is the ultimate aid for getting around New England s largest city, featuring a manageable yet intricately detailed layout of the entire city from the North End to Fenway, Brookline and Allston, across the river to Cambridge, and back through East Boston. The STREETWISE® Boston map also provides a complete map of the city of Boston's public transportation options. The MBTA subway and trolley MINI METRO map covers all stops on the Green, Red, Orange, Blue, and Silver T lines. Our pocket size map of Boston is laminated for durability and accordion folding for effortless use. Explore more of Boston by checking out the Michelin Green Guide to New England. For driving or planning your trip to and from Boston, use the Michelin New England/Hudson Valley Map No. 581. Explore the culture, history, wildlife, and architecture of New England with walks and hikes through dramatic landscapes, scenic routes, and guidance on the region's fresh coastal cuisine. DK Eyewitness Travel Guide: New England provides all the insider tips you need, whether you are sailing in infamous Newport, exploring museums of the American Revolution, or hiking across the spectacular Appalachian Mountains. The guide includes 3-D cutaway illustrations and floor plans of all the must-see sights, street-by-street maps of major cities and towns, and reliable information about getting around this incredible region. 25 Secrets you’d never find out about BOSTON! Welcome to the most Complete BOSTON Travel Guide for Tourists made by locals! If you are heading to the wonderful city of Boston anytime soon this book will give you an insight of the best places and most unique places to see where you will mingle with the locals and get to see and do the activities as one of them. Most people don't even take the time to prepare themselves in advance, and just wish for the best once they have arrived! Most people aren't aware of some of the most amazing places Boston can offer... And it'd be such a pity to miss them! That's precisely why we desperately need the RIGHT travel guide first. Don’t arrive to Boston (Massachusetts) and follow the crowds of Tourists. With this exclusive travel guide made by locals you will be finding about the places that don’t come on Lonely Planets or are listed on Trip Advisor where thousands of tourists head daily. Our goal is simple. we will give you a complete and detailed Bucket list with MAPS to all the locations to make sure you won’t get lost in the amazing city of Boston transforming your trip into absolutely amazing experience. We will help you simplify your path, showing you exactly where the best places are. Lonely Planet Pocket Boston is your passport to the most relevant, up-to-date advice on what to see and skip, and what hidden discoveries await you. Admire the elaborate Trinity Church, see the Boston Red Sox play at Fenway Park, take a picnic and people watch in Boston Common; all with your trusted travel companion. Get to the heart of the best of Boston and begin your journey now! The Perfect Choice: Lonely Planet Pocket Boston, a colorful, easy-to-use, and handy guide that literally fits in your pocket, provides on-the-go assistance for those seeking only the can't-miss experiences to maximize a quick trip experience. Looking for a comprehensive guide that recommends both popular and offbeat experiences, and extensively covers all of Boston's neighborhoods? Check out Lonely Planet Boston guide.